First of all, let us clarify the concept of the mandala. A classical mandala in Buddhism is a symbolic representation of the Universe as a pure land of the Buddhas. In the center of the Mandala there is the sacred Mount Meru — the abode of the Creator, called Adi-Buddha — and the sides of the Mandala represent all the worlds of Buddhist cosmology. This mystical figure of the Worlds is a circle inscribed in a square, which, in turn, is inscribed in a circle. The outer circle represents the Universe, the inner circle is the world of gods, Bodhisattvas, and Buddhas. Sometimes the images of Buddhas and deities can be replaced by images of their fundamental symbols, or syllables, whose sounds express dimensions of these deities. Buddha, Bodhisattvas and gods hold ritual attributes. Like shapes and postures of the deities, they symbolically express the enlightened activity of these beings and their abilities. The ability is related to one of the five wisdoms, symbolically expressed by the color and position in the mandala. Five Buddhas or Bodhisattvas symbolize the unity of the five wisdoms as symbols of spiritual Awakening. The mandala has its center and four directions corresponding to the cardinal directions. Dhyani Buddhas are located in the center and on each main side of the mandala. The square of the mandala, oriented to the cardinal points, has four T-shaped gates to the Universe. The square is divided into four parts. The fifth part is represented by the center point. The Kailash complex is a huge natural mandala. It has a center (top) associated with a giant pillar of the world connecting our physical world with the spiritual world and its cosmic basis — Adi Buddha. The top of the mountain is the First body of Buddha — Svabhavikakaya. The Kailash Mandala has a square (base of the mountain), and the Faces (walls) of this square are oriented to the four cardinal points, and there are also four T-shaped gates (approaches) to their planes. These four Faces have their own colors and elements. They are also associated with one of Dhyani Buddhas, representing the Second body of Buddha-Dharmakaya. Further away from its center the unique natural mandala is represented by eight mountains (see picture on page 248) adjacent to Kailash (marked with orange numbers). That’s the exact number of the mountains that form an extension of Kailash. In the south there are two ridges of the Inner kora (1, 3) and Mt. Nandi (2). In the west there are two ridges covering the Closed Valley at the West Face of Kailash (4, 5). In the north there are Vajrapani (6) and Chenrezig (7). In the east there is a rock mirror of the Valley of Life and Death (8). They represent the Third body of Buddha — Sambhogakaya. These “shoulders” of Mount Kailash form eight Sacred Valleys (marked with yellow numbers). And finally, the outer circle of a giant mandala represents the deep river valleys surrounding all this fantastic complex. It is associated with an inhabited universe, and the route of the outer kora passes exactly through this complex. Here is the Fourth body of Buddha — Nirmanakaya. It should be noted that the central part of the Kailash Mandala is an eight-petalled lotus with holy Mt. 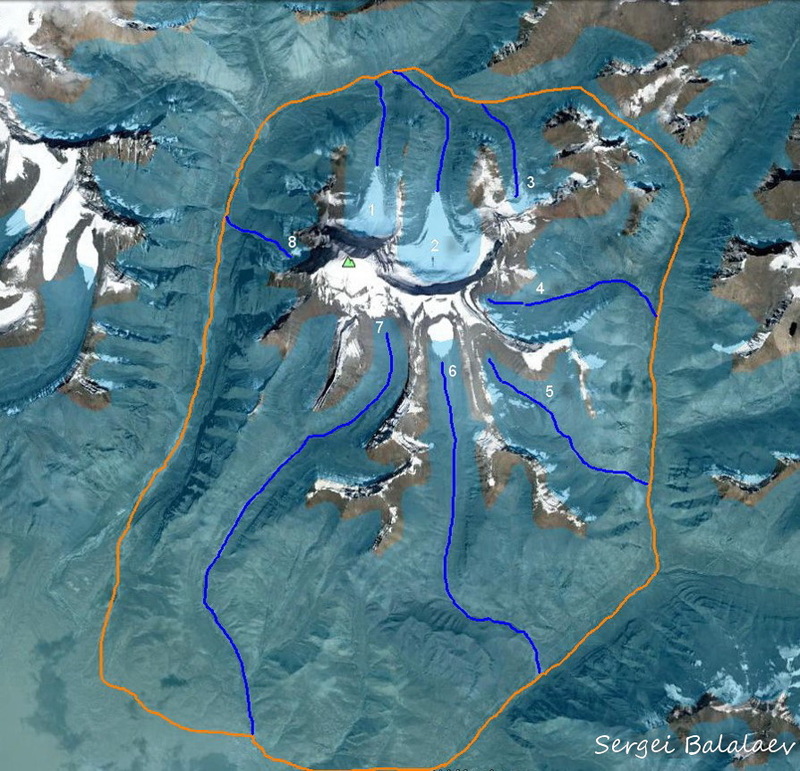 Kailash in its center. This note is important for further narration. So we talked about the mystical aspect of Mount Kailash and its immediate surroundings. But if you look at the satellite image of this plexus of mountains, we can easily see that it distinguishes clearly by its forms from the surrounding rock formations. The Kailash mountains looks like an intricate ornament of the ranges of the same height. It looks like a pattern that the Great Seal of the Eastern Lord leaves on hot wax. No matter how many millenniums have passed, the mandala representing the Seal of the Creator is unchanged over time. Human civilizations changed and will change, but the Law Code of life remains the same. The main thing here is to follow the path of spiritual development in order to understand the universal wisdom and the evolution of your own nature. Note that it does not mean a mechanical device. It means an uncreated energy and informational mechanism that significantly influences the evolution of the planet and people. Based on the hypothesis that the Earth is a reasonable being it is logical to assume that like any rational being it has organs, chakras, and energy flows. So, if we follow this logic, Kailash is one of the most powerful organs on Earth. This is a mighty «transmitter» and «receiver» having a natural origin. The Kailash complex is a huge natural mandala. It has a center (top) associated with a giant pillar of the world, Mt. Meru, connecting our physical world with the spiritual world and its cosmic basis — Adi Buddha. Note that the spine in the human body plays the same role of the central axis as Mount Meru in the Universe reproducing all its functions and laws on a microcosmic level. The Kailash Mandala has a square (base of the mountain), and the faces (walls) of this square are oriented to the four cardinal points, and there are also four T-shaped gates (or approaches) to the corresponding planes. These four faces have their own colors and elements. The outer circle of a giant mandala represents the deep river valleys that surround all this fantastic complex. It is associated with an inhabited universe, and the route of the outer kora passes exactly through this complex. The Kailash Mandala is a unique mirror-pyramidal complex that receives cosmic energy and informational flows coming down to the Earth and, at the same time, it emits flows going from the Earth. It is a powerful transceiver antenna tuned at the specific dimension of the Earth (the height is multiple to polar radius of the planet). So, we can say that it is an energy matrix of the Universe represented in stone and created by the nature. It is an integral mechanism of the Universe working on our planet! Mount Kailash is the central part of this complex. On the physical level Kailash represents a four-sided pyramid consisting of several parts with the height of about one kilometer. It is to be recalled that Kailash and its surrounding mountains are composed of many stone layers containing great amount of quartz. But these are, in fact, plates that form a giant natural capacitors … Capacitors of energy and information!.. The Kailash Mandala is a huge library, a matrix with enormous amount of information! The Kailash Mandala brings certain “reference” vibrations that allow to activate the energy centers of a man, «tune» the physical and spiritual bodies, and considerably advance the spiritual development.